Ask about our SENIOR / VETERAN DISCOUNT! Initial 20 minute phone consultation is FREE! We accept all major credit cards including Discover, MasterCard, Visa and American Express. [ 373 ] Property Owners (bigly) Saved . . . . . is bigly a word !?! If you search for ' Roof Consultants,' you'll mostly get contractors whose goal is to sell you a roof. They want your roof job. There are very few third party independent impartial legitimate consultants. I am the only one person concern. These other consultants are all top tier professionals who are very good at what they do and all with most impressive portfolios. There are many hundreds of roofers, jack of all trades, and general contractors. Many roofing estimators are paid commission only. No sale, no paycheck so the pressure is on. Many estimators have never installed a roof. Some will mislead you into thinking your roof is in much worse condition than it actually is. Anyone can put a ladder on a truck and call themselves a 'roofer'. I am an impartial third party and you benefit from my 41 yeares of experience. When many roofers and I look at the same roof we see two entirely different things. There are many good, solid, stable, customer-oriented, professional roofing companies that even I would hire and actually have once to roof my other house that Mom lives in. CC&L Roofing did a fantastic job - and I often refer them to people. I receive no finders fee or 'kickback' from anyone I recommend. I would be happy to email you this list if you complete my Oregon Roof Consulting Contact form and check the “Please email me a list of Top-Tier Roofers” box. However, for every really good company, there is at least 40 flaky, unprofessional, unqualified, moderately skilled (at best) company. A large percentage of roofs I look at have significant issues that need attention. Legitimate quality control is the exception rather than the rule. Homeowners (assume) they're getting quality. You can find other roofing consultants in our area, including a few who do residential work. 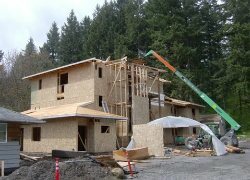 All roofing consultants in the Portland area are fully qualified and professionally competent regarding the operation of their business and are very good at what they do. Most consultants tend to focus on institutional, schools, government jobs and large commercial projects. Most perform residential consulting work. My rates will be more affordable as I work from home and am a one person operation. Much of what I do is residential and small / medium commercial or multi family dwellings though you'll find some very large projects in the 'Photo Gallery' and also the 'Blog'. Also I only do one job at a time and do everything myself so you get personal service every time. No university or college offers a degree in Roofing, though various consultant designations are available such as RRO ( Registered Roof Observer ) and RRC ( Registered Roof Consultant ). For example, to become an RRO you must have a minimum of 2 years actual roofing experience - which isn't much - fill out a plethora of paperwork, fly cross country to take an expensive test, then pay more money to join an organization who bestowes the RRO moniker upon you. All professional roofing consultants in our area are extremely professional and are more than qualified in regard to their abilities. Some but certainly not all roofing consultants and their employees have somewhat limited real hands-on and varied roofing installation experience. ORC has read the bios of all employees of the other roof consultants on their websites and none of them have as much hands on and varied experience as we do. None. My expertise took nearly four decades to obtain the old fashioned way: Starting in 1974 packing bundles up a ladder to eventually doing quality roofing work. See Joe's Projects in my Gallery and in my SuperRoofer Blog for examples. Check out my history at About Joe and my Home page. And, of course, read the Testimonials and References from customers, roofing products companies, and other construction professionals. Remember, I'm not here to sell you a roof or even to repair it. I am selling nothing. I install nothing. I am an owner advocate, I receive zero finders fee or 'kickback' from roofers I recommend. It is my job to steer you in the right direction. I'm here as an impartial third-party to help you find the best roofing services available and to make certain your job is/was done correctly.I will make certain that the scope of work is tailored to your project and that corners are not cut and inferior components are not used on your roof. You benefit from my experience. Residential and commercial roofing project consulting. From just explaining what you have and what you need, to helping find the right contractor, to assisting with the entire project, to final inspection and walk-through, I can be your homeowner or property owner advocate. I can also assist architects / designers, homebuilders / remodelers, as well as real estate and insurance professionals with their roofing needs. Regardless of the roofing work you are used to I can orchestrate a significant quality upgrade for a fee that is reasonable. Your job will be top notch and done properly. Over the years, I have developed a list of roofers who are top tier. I will never accept a finder’s fee or kickback for my recommendations. After all it's my job to point folks in the right direction! I would be happy to email you a list of great roofers in our area. Simply visit my Oregon Roof Consulting Contact form and check the “Please email me a list of Top-Tier Roofers” box. There’s absolutely no charge for this list! New roof inspections: Was it done right? This is especially helpful for out-of-town owners, but is crucial to all jobs. I can monitor your project as much as necessary. I will write and email a report and also send you photos of that day's activities each day that I monitor the project. I text & photo-document everything. I am extremely thorough. The degree of my involvement is totally up to you the owner. Many contractors are good, but many are not and they sell a lot of roofing jobs, mainly by lowballing bids and cutting corners that you are not aware of and will never find out about until the roof prematurely fails and the labor warranty has expired or the roofer is out of business. The huge amount of negative customer (victim) reviews all over the internet is mind boggling. Some 'estimators' have never worked on a roof and have zero technical expertise. They're just salespeople. They might as well be selling carpet. Some estimators are paid commission only so the pressure is on. No sale no paycheck. In my opinion, at least 75% of all roofs are not installed to manufacturers' specifications. Improper nailing a HUGE issue, thereby nullifying (at least) part of the material warranty. There ARE guidelines. There ARE rules. Most companies pay piece work, which encourages speed and can compromise quality. I would feel more comfortable using a contractor that paid salary or hourly. Bottom line takes priority over customer service much of the time. All materials are NOT created equal. That goes for composition shingles, cedar roofing, flat systems, sheathing, underlayments, flashing, and various other components. Many roofers use 15-year parts on 30-, 40, and 50-year roofs. I still haven't figured that one out. Perhaps bottom line has something to do with it? See my Blog for description of inferior components frequently used. Having done over 10,000 estimates with millions in sales, I can give an accurate high / low range of prices you can expect on estimates you receive from contractors. If you get 20 bids, you will get 20 prices. The difference could be thousands of dollars for essentially the same job. Really! All roofers say they are the best. Reminds me of that 'Dire Straits' song lyric line, "Two men say they're Jesus, one of them must be wrong." Many roofers have a big hat but no cattle. Some companies must be avoided. I cannot emphasize this enough. I can help you choose a qualified installer. I will translate your bids into terms that you can understand. Your job (will) be done correctly. I put the scope of work together so it is tailored to your specific project. We tell them how it will be done. When the job is completed I will inspect it to make certain the specifications in the bid have been adhered to. I have given technical advice to able-bodied owners with a building background on how to do it right. Many roofs are too dangerous to be climbing on for the novice, but one-story low-slope roofs can sometimes be adequately installed by the owner with the right guidance. Start off on the right foot! It is costly, time consuming and embarrassing to start off on the wrong foot. I can help. Too many callbacks? Too much damaged gutters and siding during your installs? Employees stealing you blind? Will distributors only sell to you on a cash first basis? Are you putting uninsured company vehicles on the road? Did your last GM embezzle $440K? No habla ingles? Putting different roofers on the job each day? Do your installers have a bad attitude because you are not paying them fairly? No (real) quality control? Do you micro-manage every aspect of your employees work regimen? Do you demand that the workers hurry up, slap it on, hope for the best, race to the next job? Tearing a roof off in the rain? Using 15-year parts on a 50-year roof? I have seen all of this first hand. Become truly 'Professional'. No business fails intentionally. Nobody knows everything. Some of us know more than others. Installer and estimator turnover is high in this industry. Kind of like pro-sports free agents. Hire the right people. Separate the skilled from the moderately skilled. Train them. I can help. Many roofers will tell you that a new roof is overdue when a repair will get you by for many years. The roofing trade employs a lot of unscrupulous characters. Steer clear of these folks. I can help you avoid them. Job not going right? Did you hear something disturbing from one of the roofers? Concerned you may be getting taken? I can moderate a dispute before it escalates into something nobody wants to participate in. Before you call a lawyer or go to small claims court, contact me; I can help. I have successfully assisted homeowners in disputes. First and last 20 minutes of driving time are free. Hourly rate of $60 begins after that. One free hour after each seventh hour for lengthy projects. Access relating to terrain; roof pitch; # of stories; etc. Roof Certifications**: $250 minimum. Realtors require a roof certification on nearly all property sales as one of the requirements to complete the sale. Typically a 3 year or 3 / 5 year certification is needed. Price is determined by same considerations as inspections. ** I do not give a warranty or guarantee**. Some roofers will but that warranty will cost you thou$ands of dollar$. ** Roofers give free estimates because they want to sell you a roof job. I am not selling anything except my time, advice, and experience; for this reason, I do not offer free consultations or any other free services at this time. No down payment for jobs $500 or less. $300 down payment for jobs more than $500. Some jobs will require pre-payment with credit or debit card. Large projects are billed weekly. Final payment in full is due upon completion of my involvement and your receipt of invoice. After 30 days the bill will be turned over to a collection agency and their fee will be added to the amount due. Please acknowledge your agreement to the BILLING POLICIES set forth on this page. You must agree to these policies in order to receive services from Oregon Roof Consulting and Inspection. We look forward to working with you soon!